Work to improve the Bay View plant finished in 2007; the city’s wider initiative is scheduled for completion in 2010. The Toledo skyline: the $450m Toledo Waterways Initiative is a 15-year scheme to upgrade and improve the city’s ageing facilities. Building the grit facility in June 2006. Work at the plant has doubled its treatment capacity and made a big improvement to its ability to handle wet-weather flows. One of the new pump stations required; some of the existing facilities were decommissioned and demolished as part of the project. The new wet-weather facility at the Bay View plant. 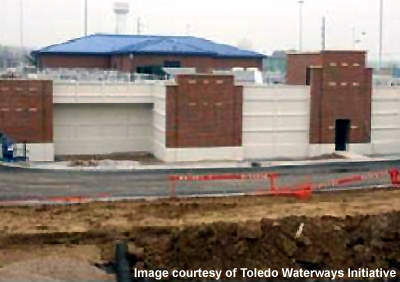 In 2007, the completion of more than $123m worth of improvements at the Bay View wastewater treatment plant marked the end of the first five-year phase of the Toledo Waterways Initiative, which was under budget and ahead of schedule. Said to be one of the largest in northwest Ohio, the plant’s upgrade involved the provision of a new 227,000m³ equalisation basin and additional wet weather capacity aimed at doubling treatment capability and eliminating the need for partially-treated discharges. Black and Veatch provided programme management for the project and in October 2008, the company announced that it had been selected to provide engineering and construction management services for the next ten-year phase. This part of the scheme calls for an extensive programme of work to improve sewers in many areas, involving the installation of new sewer / force mains, the construction of a number of new pump stations and the decommissioning and demolition of some of the existing overflow pump stations. The total cost of the Toledo Waterways Initiative is $450m. 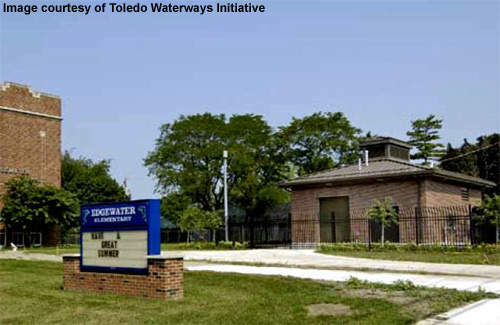 The Toledo Waterways Initiative arose to solve a long-standing problem of contamination of the area’s major watercourses, Swan Creek, the Ottawa River, and Maumee River. Although sanitary and storm sewers have been constructed as independent systems since the 1950s, around a quarter of the city is still served by the old-style combined connections. At times of heavy rain, the excess flow in these combined sewers can overload the wastewater infrastructure, leading to the storm-water/raw sewage mix backing up into homes or over-flowing into waterways. The resulting pollution caused by these discharges ultimately led to the commencement of legal proceedings against the city by the US Federal and Ohio State Environmental Protection Agencies (EPA). 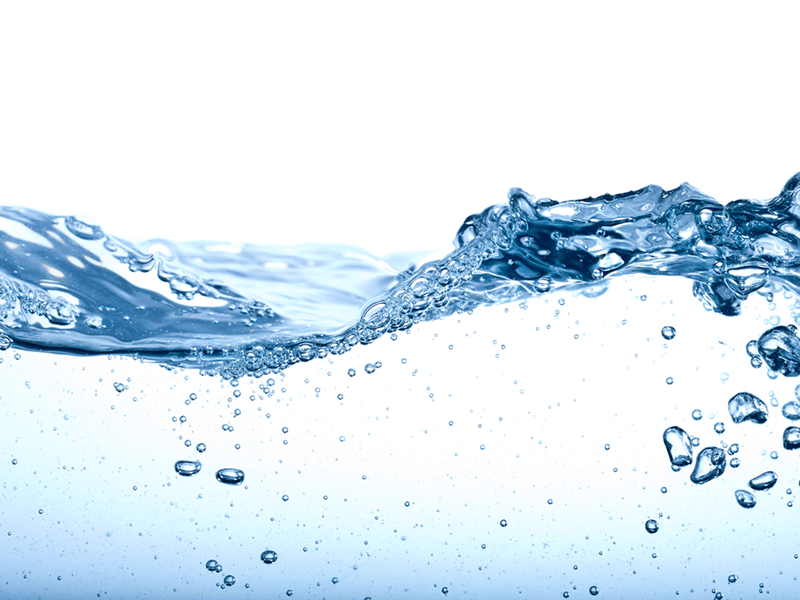 "The equalisation basin will hold peak wastewater flows which exceed the plant’s capacity." The situation was resolved in July 2002, with overwhelming public approval for a proposal to upgrade the sewer and wastewater treatment facilities and thus settle what was, by then, an 11-year old lawsuit. Although this meant that consumers would face incremental rises in their sewer charges over the project’s 15-year duration, detailed analysis of the overall state of the sewer system had revealed that nearly half of the existing lines were in either a poor or critical condition. However, to reduce the impact on residents, the city authorities are also actively pursuing other possible avenues, including direct funding and grants, such as the one received in 2005 from the US EPA for the equalisation basin project. In November 1922, Bay View was intended simply as a pump station to provide centralised discharge, but prior to completion, its role was extended to include treatment by order of the Ohio Health Department. The plant’s primary treatment facility came into service in June 1932 and has been modified and upgraded many times over subsequent years. Today, treatment comprises screening, grit removal, pre-aeration, swirl concentration, primary clarification and aeration followed by conventional secondary treatments and step-aeration activated sludge processes. Effluent discharge is to the Maumee River. 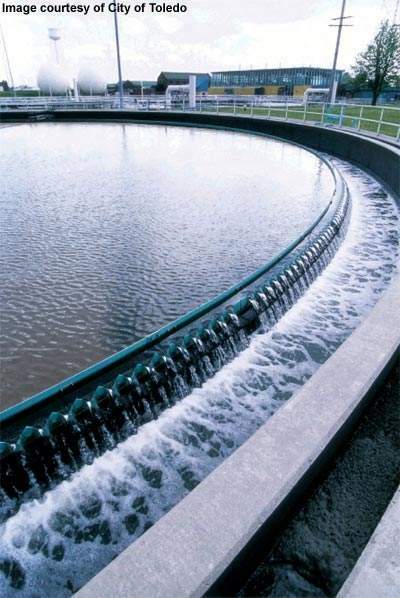 Sludge treatment comprises gravity-thickening for primary sludge, dissolved air flotation of the waste-activated sludge and digestion of the thickened primary and waste-activated sludges. After the digested sludge has been dewatered by belt filter process, it is transferred off-site for beneficial agricultural use. "The Toledo Waterways Initiative arose to solve a long-standing problem of contamination of the area’s three major watercourses." The recently completed equalisation basin and enhanced wet weather treatment capacity almost entirely removes the need to discharge untreated wastewater into the Maumee River during heavy rains. The equalisation basin will hold peak wastewater flows that exceed the plant’s capacity, which has itself been extended to cope with up to 600,000m³/day of combined raw sewage during storm periods, until the immediate demand is reduced sufficiently to allow it to be treated. The size of these facilities means that they could not both be accommodated within the existing works boundary, ultimately leading to a portion of the adjacent City-owned golf course being adopted to house the equalisation basin. The design phase concluded in September 2004, with construction beginning in June the following year. The wet weather facilities were completed in the autumn of 2006, the first part of the equalisation being concluded in December. Final completion of Phase I followed in 2007. The programme also comprises a series of sewer upgrades to compliment the work at the WWTP. As part of the project, more than 8km of new sewer / force main has been installed around Point Place, two new pump stations built and the three existing sanitary sewer overflow pump stations demolished. The work was undertaken in three phases, beginning in September 2003 and concluding in the late spring of 2006. Another large, three-phase sewer improvement project is currently being implemented in the River Road area of the city. Construction began in 2005 and will close with the scheduled completion of Phase 3B in 2010. In addition, the Bennett area of the city has also undergone an evaluation of its sanitary and storm sewer system, the fieldwork began in February 2006 and concluded with the final report in March 2007. "The programme comprises a series of sewer upgrades to compliment the work at the WWTP." The final – and arguably the most important – component of the project involves the adoption of a Long Term Control Plan. Required as part of the necessary Consent Decree, this sets out the improvements that are proposed to address the city’s particular problems, ensure that federal and state water quality standards are met and improve water quality for recreation and aquatic life. The City of Toledo own and operate the facilities; they awarded the programme management contract for the water initiative project to Black and Veatch. The project employs a number of engineering, construction and project management sub-contractors, including Arcadis FPS, Brigette’s & Associates Inc, the Mannik & Smith Group, Ribway Engineering Group, G. Stephens Inc, and Polytech. 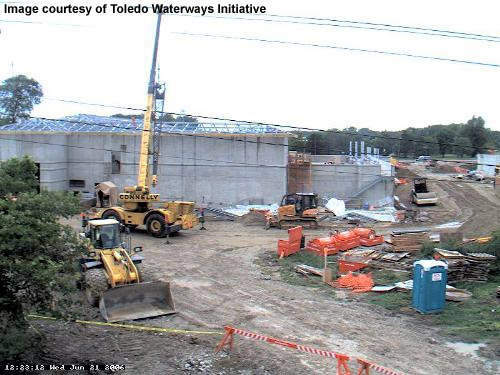 Capacity Building, a collaboration between the City of Toledo, the University of Toledo and the Associate General Contractors of Northwest Ohio are involved in the construction. ERC provide financial consulting services, CSO Technik is supplying the Vacflush storm tank cleaning system; testing services are by TolTest. Other subcontractors involved include Mijan Designs Inc, SSOE, Water Resources Strategy, Woodlands Consulting Group, Tucker Young Jackson Tull, Funk Luetke Skunda, Limno Tech, Tetra Tech, Hull & Associates and Vision Mechanical.